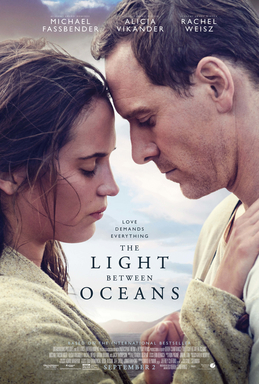 Derek's Cianfrance's The Light Between Oceans, from the M.L Stedman novel, is a story about a couple in love who do a bad thing out of love. Michael Fassbender stars as Tom Sherbourne, a handsome and quiet man who just ended a four year tour in Europe in WWI. The first time we see Tom, we see a man who is probably suffering from PTSD, so to ease himself back into society, he seeks out a temporary solitary job as a lighthouse keeper. We see the inner turmoil that Tom is experiencing as he sits alone looking out into the ocean from the lighthouse with teary eyes contemplating his life. Tom catches the eye of a young and spirited woman named Isabelle, played by Alicia Vikander, who immediately takes a shine to the shy and quiet Tom. After several months, the solitude on the lighthouse island makes Tom yearn for changes. The only way a female can visit him on the island is if she's the wife of the lighthouse keeper. Tom and Isabelle exchange letters over the course of weeks and they agree to get married. Michael and Alicia have great chemistry on screen as Tom and Isabelle, and the emotional depths of the Sherbourne marriage is tested when they suffer two miscarriages within two years. They both have experienced so much death in recent years that they both yearned to start a big family. But the miscarriages take a particular toll upon Isabelle. However, one day, as Isabelle was mourning the latest miscarriage, her and Tom hear the mysterious cries of a baby on a small boat approaching the lighthouse in rough waters. They found on the boat a baby girl and a dead man's body. Tom and Isabelle immediately tend to the needs of the baby, however Tom feels obligated to report this finding as it is required of him. Isabelle so desperate to fill the gap in her life due to the miscarriages, convinces Tom that it's meant to be for them to keep her. The baby would have died just like the man if they hadn't found her. They can simply pretend that the baby is theirs and their lives would be perfect, and they will be giving the child a good life. Reluctantly, Tom concedes to Isabelle, and he does not file a report. He buries the dead man, and sends the empty boat back into the water. But before doing so, he removes a unique baby's rattle found in the boat. Tom logs into the lighthouse journal that Isabelle gave birth to a healthy baby early and that no medical attention was needed. Over the course of weeks, Tom is wrecked with guilt, but he sees how Isabelle has immediately bonded with the child, and he too comes to love the new found hope and the loving warmth that baby Lucy brings to their marriage. Over the course of the following year, the Sherbourne's are a picture perfect beautiful and happy family. On the day of Lucy's Christening on the mainland, Tom observes a woman, Hannah played by Rachel Weisz, kneeling by a tombstone weeping. He's mesmerized by her, and as she leaves the grave site, Tom reads the tombstone and notes the date and year of the death of a father and infant daughter at sea. His world comes crashing down like stormy waves against razor sharp hard rocks. He found Lucy's heartbroken mother who thinks her husband and daughter are dead and lost at sea. The guilt of hiding his daughter's true parentage has re-opened a sore wound in Tom's heart. So guilt ridden and feeling sorry for Hannah, Tom leaves her a note that Lucy is not only alive, but very much loved and well taken cared of, and that Hannah's husband is at peace. With this startling news that Hannah's daughter, Grace, is still alive, she has renewed hope in finding her, but she doesn't know who sent her that note, and the police don't have much evidence to go on. But Hannah's wealthy father increases the reward in finding Grace. A couple years later, at a local event celebrating the lighthouse, Tom and Isabelle meet up face to face with Lucy's mother, but no one is aware of the tragic circumstances surrounding this beautiful little girl. But Tom knows everything and he cannot tolerate the facade any longer. He informs Isabelle that Hannah is Lucy's real mother and that they must confess to their wrong doing. This information almost destroys Isabelle and she does not want to give up Lucy. But Tom sends the baby rattle to Hannah as a bread crumb to come find Lucy/Grace. The police put up a photo of the baby's rattle, and almost immediately the police are pointed into the direction of the lighthouse. Tom is expecting them and he's relieved that this is nearly over, but he is also sadden that this means that he will forever be separated from Lucy/Grace and that he will go to prison and be separated from Isabelle. He tells Isabelle that the police are coming to take their daughter and that he is going to take the full blame. 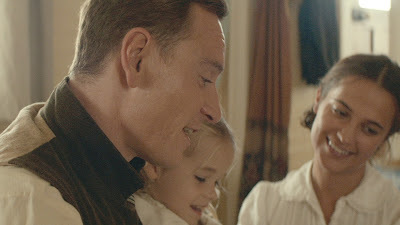 Even though it was Isabelle that wanted to keep the baby and pleaded with Tom to support her wishes, out of his love for Isabelle, he will take the full blame. The police arrest Tom, and as they take them all to the mainland, Isabelle is destroyed by the fact that her happy, beautiful family has disintegrated before her very eyes. Alicia really did a great job in conveying the complete heartbreak that a mother experiences when her child is forcefully taken away from her. As Tom is put into jail, under the assumption that he not only stole a child, but killed the father too, he faces the death penalty for his actions. Meanwhile, Isabelle is bed ridden with angst at her parent's home and refuses to read the letters sent to her by Tom. Hannah is desperately trying to help Lucy/Grace transition into her life, but at four years of age, Lucy wants to be with her family at the lighthouse across the ocean. In a chance encounter in public, Hannah sees how much Lucy loves her mother, Isabelle, and she later presents an opportunity to Isabelle that gives Isabelle a glimmer of hope. Hannah's proposition compels Isabelle to finally read the letter that Tom sent to her, and she then realizes that she's been selfish in her mourning and needs to do something to prevent Tom from taking the full responsibility of their actions. As Tom is about to be taken away, permanently, Isabelle tells Tom how much she loves him and she confesses to the police that it was she that made Tom help her keep the baby, and that the baby's father was dead when they found him. This revelation, while still making both Tom and Isabelle guilty of keeping a child they had no right to, Hannah empathizes with their situation and requests leniency. Tom and Isabelle go to jail for their crime of kidnapping and hiding a dead body. In the end, what the Sherbourne's did was wrong, but their hearts were in the right place, however, at the sake of another woman's shattered heart. The cinematography of The Light Between Oceans was breathtaking, I felt that some landscape imagery had deliberately long shots just to allow us to gasp in amazement of the lighthouse island, the ocean, and sunset views. 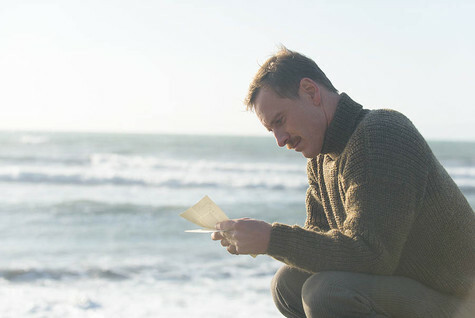 Contrary to Alicia's emotionally wrought performance as a young woman who suffered the mental distress of two miscarriages and forceful removal of a child she raised for four years, there was Michael Fassbender as the pillar of strength that suppressed years of personal, emotional, and mental scars from the war, and in trying to provide for a wife who had a strong independent streak. Michael as Tom was a man who internalize his guilt of one day being afraid that his beautiful little world would be discovered as a fraud and he would lose everything. His eyes expressed sorrow and hope, love and despair, loyalty to his wife, as well as an obligation to do the right thing for Hannah and Lucy Grace. Some editing for the flashback scenes were a bit abrupt, but once you got the sense of what was going on, it provided much needed context to what lead up to Lucy/Grace and her father being in the boat, and Hannah's loving relationship with Lucy/Grace's father, a German whom Hannah's father disapproved of and the reason why he disowned her. Some criticism of the ending of the film expressed that it was rushed, but I don't fully agree with that. Yes, things wrapped up quickly, but the movie had to move forward 15+ years by not focusing on any of the jail time Isabelle and Tom had to do, but move on to see what came of them afterwards. Michael Fassbender was a beautiful, somber, protective, loving family man. In the very end, a grown Lucy Grace found Tom, much to his surprise, and introduced him to her infant son. Just when Tom was entering the last stage of his long, sad life, he has a newfound reason to look out into the ocean with hope in his heart. The baby girl he saved and raised so long ago, loves him, and wants to share a piece of her life with him again. And that was the light that Tom so desperately needed now that he was all alone in his retired years. A Labor Day weekend release really doesn't do justice for this film. It's technically a slow weekend while everyone is outside enjoying the last weekend of the summer. This is a film that should have come out in October/November, or March/April, to find it's niche audience that would better appreciate it. Immediately after I saw the film, I gave it a 4 out of 5 stars, but after more thinking about it and letting the film sink into my mind, I came to love it even more and was moved by how it moved me, so I'm giving it an A- (4.5/5).